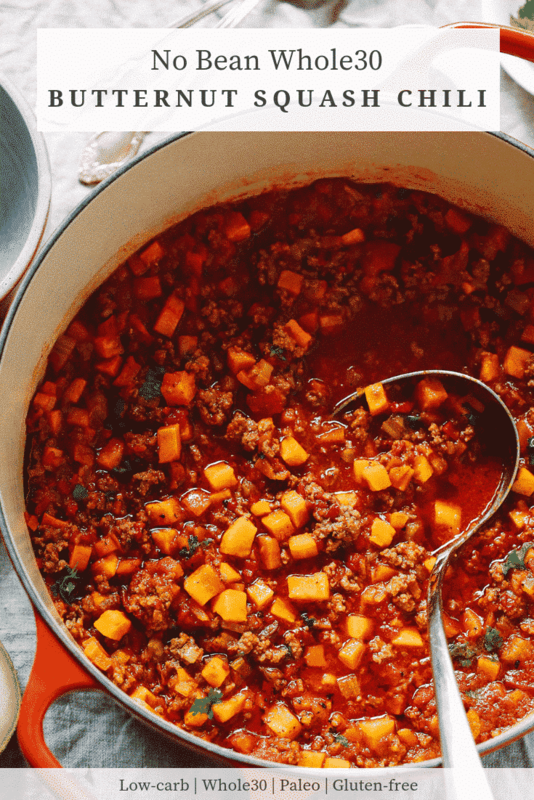 This No Bean Whole30 Butternut Squash Chili is a perfect recipe to indulge yourself this fall. It’s thick, rich and hearty. It’s also low-carb, paleo and gluten-free. You can see by the amount of Whole30 and low-carb chili recipes I’ve been posting lately that I eat bowls of chilli a lot during cold season. Yes, I do and I love them because for me there’s nothing more comforting than a hot bowl of chilli or soup. 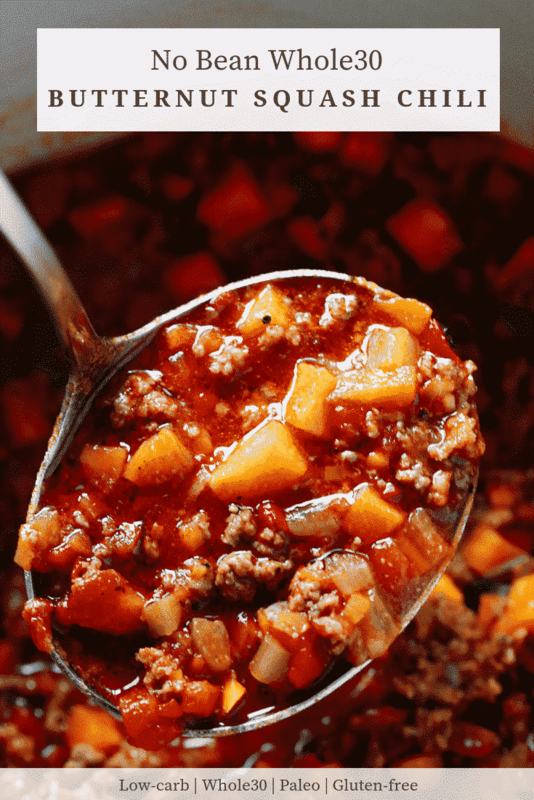 I mean this Whole30 Pumpkin Chili or this Whole30 Sweet Potato Chili recipes are just hot, comforting, and packed with flavor that make you smile even when the day it’s dark and chilly. So, this delicious No Bean Whole30 Butternut Squash Chili goes hand in hand with cold weather and perfect to warm you up. 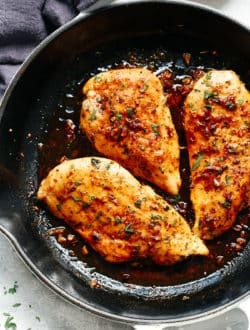 It’s super flavorful with lots of spices such as red pepper flakes, ground cumin, paprika, ground coriander, onion powder, garlic powderand black pepper. It’s It’s meaty. It’s rich. It’s low-carb and it can have less carbs if you reduce even more the amount of butternut squash and tomatoes. 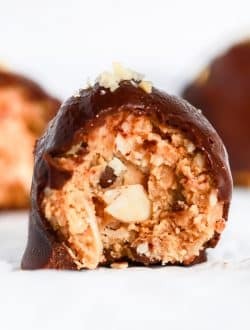 It’s paleo and whole30 too because there are no beans. Although if you don’t mind the beans you can add 2 cups of cooked beans in this recipe. Just don’t forget to add 1 more cup of chicken broth. Otherwise the chilli will be very thick. Perfect meal to sneak some veggies for the kids. 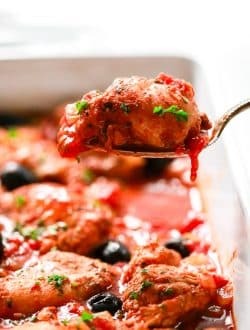 There are lots of veggies in this recipe such as onions, celery, bell pepper, tomatoes and of course butternut squash. It’s great as leftovers. 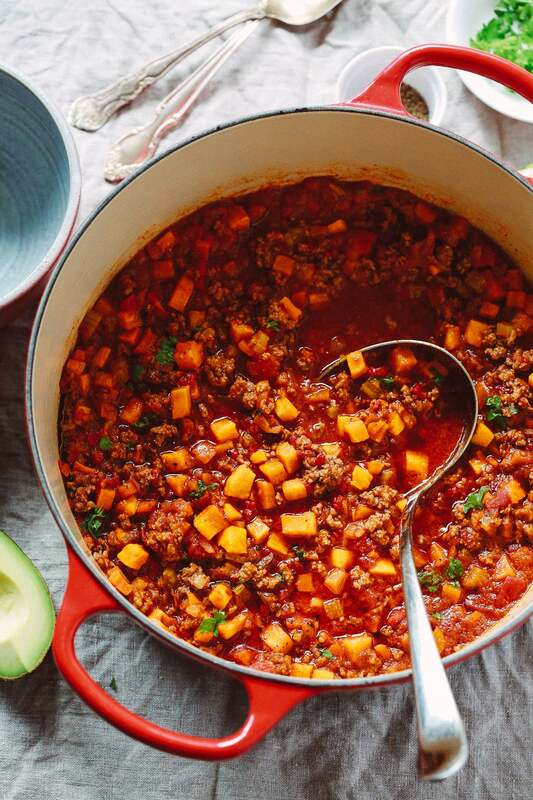 This No Bean Whole30 Butternut Squash Chilirecipe will make a decent sized batch of chilli. You probably will have leftovers for lunch during the week. It tastes even better on the next day. After all these reasons, I think I convinced you to make this No Bean Whole30 Butternut Squash Chili, right? 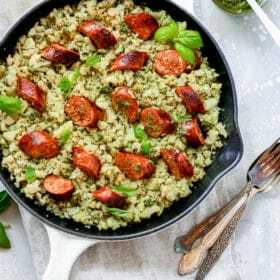 Please, try it and top it with a bit of minced cilantro and other topping too if you prefer such as avocado and jalapeno. In a large Dutch Oven Pot, heat olive oil over medium-high heat. Add celery, red onion and sauté for 3 minutes. Then, add garlic and sauté for 30 seconds longer. Add ground beef and cook, breaking up the beef with a wooden spoon, until it’s cooked through, about 5 minutes. Add red pepper flakes, cumin, paprika, coriander, onion powder, garlic powder, salt, and pepper to taste. Mix everything well. Add red bell pepper, butternut squash, diced tomatoes, tomato sauce and chicken broth. Stir, bring to a boil, cover with a lid and bring to a simmer. Cook the chilli for 30-40 minutes. Hi! 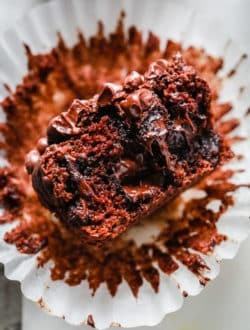 This looks divine! You don’t mention any pre-cooking of the butternut squash. 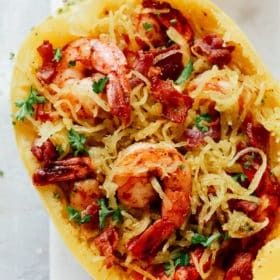 Since I don’t want to dice raw squash, do you have any recommendations for how much to pre-cook it? I will probably just cook it half way, maybe even in my instant pot, and then go for it, but I thought I’d ask a PRO. 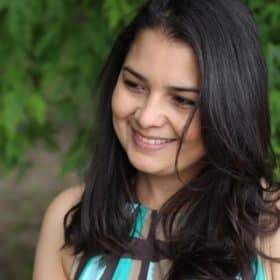 🙂 I am older but new to inventive cooking since I changed my lifestyle with whole30. 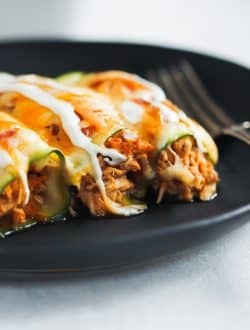 Thanks for being out here posting great recipes! I just made this and it’s delicious. 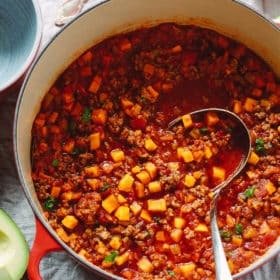 I wouldn’t have thought to put the squash and sweet potatoes in a chili recipe but they balance out the flavor nicely. The only adjustment I made was to use a large can of San Marzano tomatoes instead of sauce. 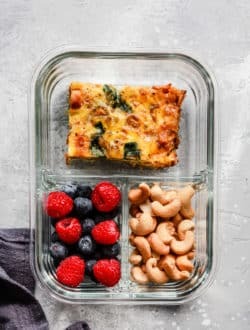 I will make this again to pack for lunches all week. Made exactly as written and it is divine!!! Will definitely make again. I’ve made this twice now, once with store bought pre diced squash and once with frozen butternut squash. It was better with the fresh, but delicious either way. It will become a regular in my winter cooking rotation, and I keep telling friends about it. 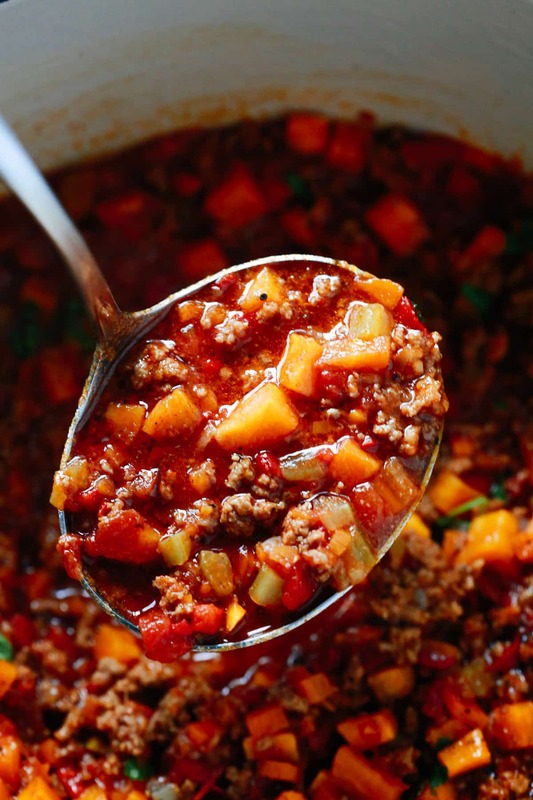 I never take time to leave comments on recipes… but this chili was soooo good!! Definitely will be on my weekly rotation!